Each model consists of 3 modular pieces; a center ,inner and outer corner that can be seamlessly combined. Naming convention used is: Dec_mold_### where ### stands for center/inner/outer. Polygon count varies between 3,874 to 59,642. 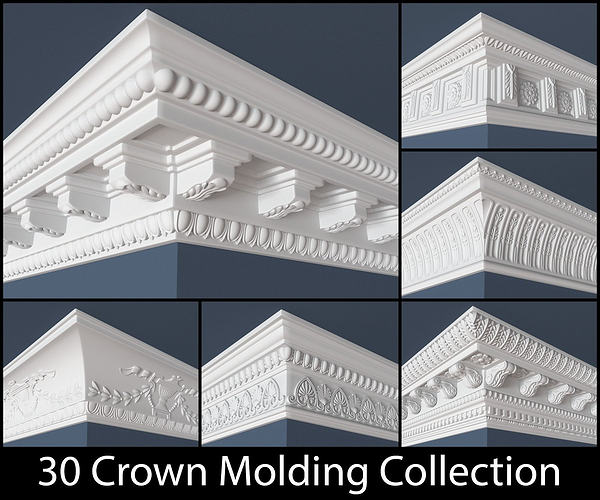 Polygon count shown in the 3D model specification section is the sum of all 30 models. A 8 page .PDF file is included with a preview of 4 models per page so that you can easily decide which model best suits your scene. Please feel free to check out my profile as all models included in this collection are also available for individual purchase. Also there you can find more details about individual polycount and topology as more wireframes are available there.